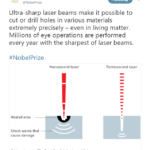 The Royal Swedish Academy of Sciences today announced that the 2018 Nobel Prize in Physics is being awarded “for groundbreaking inventions in the field of laser physics”, with one half to Arthur Ashkin (US) and the other half jointly to Gérard Mourou (France) and Donna Strickland (U.Waterloo, Canada). Dr. Ashkin is recognized for his development of “optical tweezers” which have allowed tiny organisms to be handled with light beams. Drs. Mourou and Strickland share their prize for “their method of generating high-intensity, ultra-short optical pulses”. Canadian physicist Dr. Strickland is being recognized for her research on laser beam amplification and compression undertaken while a PhD student working with Dr. Mourou. 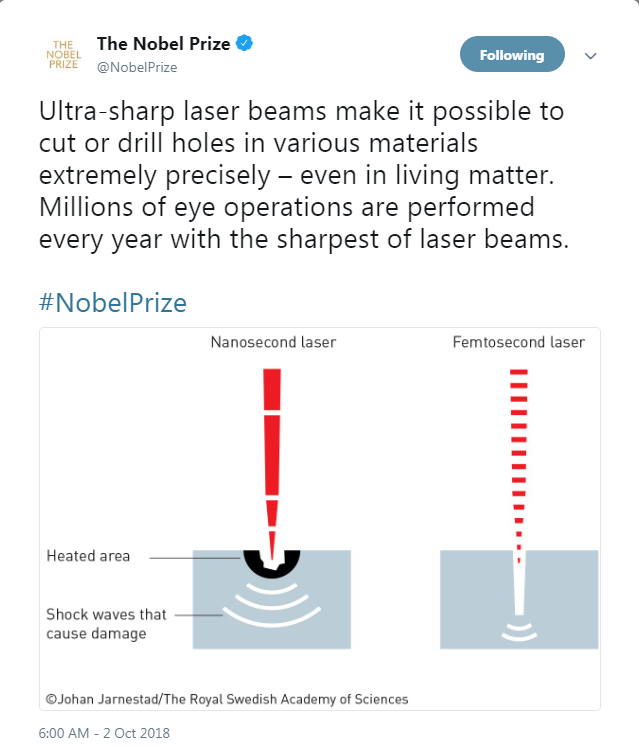 Her work on developing the very short, very intense laser pulses, referred to as the Chirped Pulse Amplification (CPA) technique, has transformed the world of laser physics, and opened this field of research to many others around the world. It has led to improvements in eye surgery and machining applications, among other things. Dr. Strickland noted how honoured she feels to be a co-recipient with her PhD supervisor and mentor, Dr. Mourou, and how pleased she is that Dr. Ashkin is being recognized for the many discoveries he made early on that others in the field have benefited from and built on. 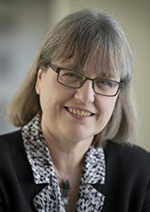 When it was pointed out to Dr. Strickland during her announcement interview that she is only the 3rd female physicist to be awarded the Nobel Prize in Physics and the first since 1963, Dr. Strickland replied “Is that all? I thought there might have been more. We need to celebrate women physicists because we are out there. I am honoured to be one of them.” In her congratulatory note to Donna, CAP Vice-President and Chair of the CAP’s Equity, Diversity, and Inclusion (EDI) Committee, Dr. Shohini Ghose proudly wrote “Wonderful news! Congratulations, Donna for transforming physics and shattering glass ceilings!!”. The CAP supports and celebrates the contributions of women and minorities in physics and is committed to building an inclusive community that promotes excellence in physics. 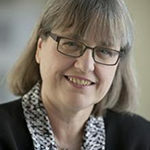 Upon hearing of this year’s announcement, Dr. Bruce Gaulin, President of the Canadian Association of Physicists (CAP), said “The CAP and our Division of Atomic, Molecular and Optical Physics, Canada (DAMOPC) are thrilled that Donna has been recognized for her contributions to this groundbreaking research development. We have been very fortunate that Donna is a longstanding and dedicated supporter of the CAP, having recently served as CAP Director of Academic Affairs, and we are delighted to celebrate her magnificent achievement”. The Canadian Association of Physicists congratulates Arthur Ashkin, Gérard Mourou, and Donna Strickland on this prestigious award and for this important advancement in physics research.